Digital Signage Solutions from Signbox Microsystems align closely with the requirements of key industries like Transportation, Financial Institutions, Entertainment and Fast Food Menu Boards. Digital signage and digital-out-of-home (DOOH) advertising are quickly becoming a popular, and often essential, method of communication across nearly all industries. 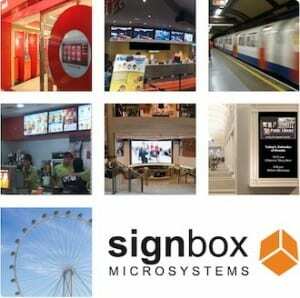 Signbox Microsystems develop digital signage solutions software and modules in alignment with the requirements of key industries –particularly for Financial Services, Transportation and Entertainment. Our focus industries have always demanded an extremely high standard of system and network security, complex hardware integration, customisation and real-time interactivity. Signbox Microsystems digital signage solutions are robust and flexible and are now widely installed in Hospitality, Retail, Corporate & Government and many other sectors.